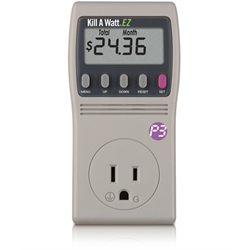 Cut your energy costs at home with the Kill A Watt EZ Plug-In Voltage Tester. 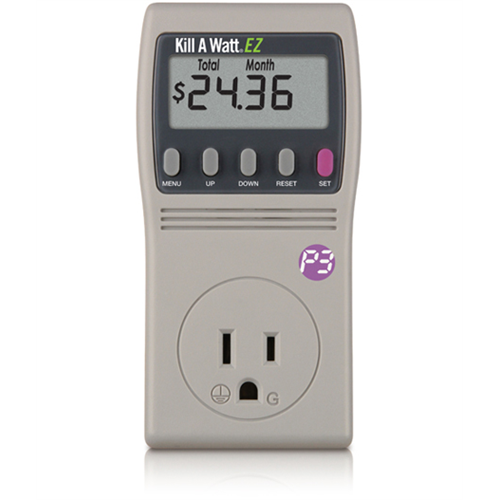 Simply connect your appliances to it and the Kill A Watt EZ will determine how efficient they are. The large LCD display with count energy use by the Kilowatt-hour (KWH) and can also forecast consumption by the hour, day, week, month and year. Voltage and current are measured using true RMS methods to provide the most accurate results within 0.2%. The unit displays 10 critical units of measure: Volts, Amps, Watts. Hz, VA, KWH, PF (power factor), elapsed time, rate and cost. Great for detecting energy hogs and phantom energy use, you can also use it to test out major appliances before deciding to purchase them to further save money in the future. A built-in battery backup ensures all accumulated readings are stored in case of power interruption. Dimensions: 5 1/8” x 2 1/2" x 1 1/2"